Shown with proper placement of two arms between clamp halves. The clamps are what hold the ball ends together. They function much as your own arm joints function. 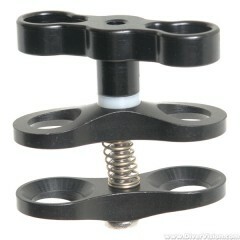 Our system is designed for three clamps per arm side. This gives you the greatest flexibility of movement, i.e. you have a joint at your wrist, your elbow, and your shoulder. A regular or new style clamp holds two ball ends together, a triple clamp holds three ball ends together. When assemblying your arms and clamps, place the ball ends in between the identical parts of the clamp and use the T-knob to tighten or loosen. It is easy to accidently put the ball end between a clamp half and the T-knob. 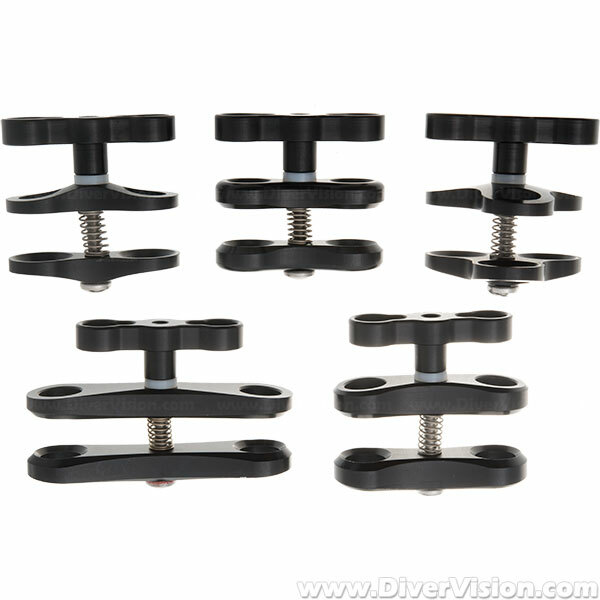 With our clamps you do not need to tighten them so tight that you have trouble loosening them underwater. The o-ring in the balls allows you to tighten the clamps much looser than other manufacturers clamps and the strobe will still be held in the position you want it in. Never put only two balls into a triple clamp as the bolt will bend.